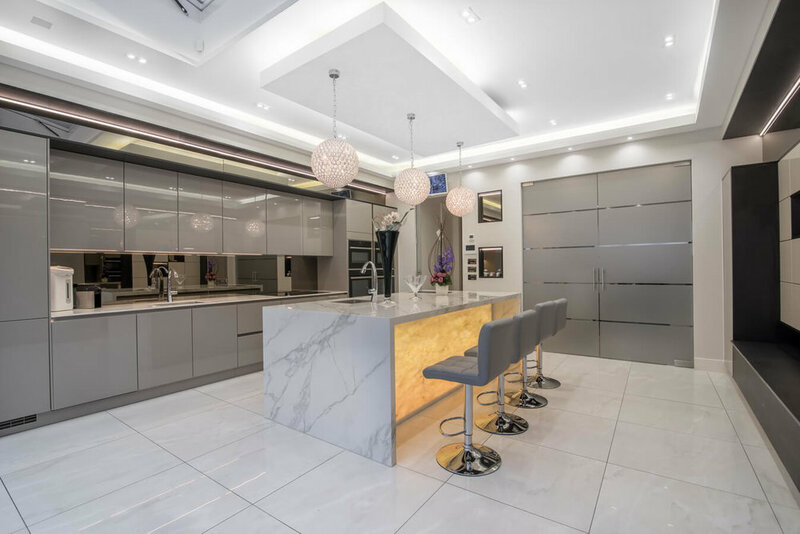 Since opening our showroom in 2014 many local Jewish customers have approached us with the brief to design them the perfect "kosher kitchen". 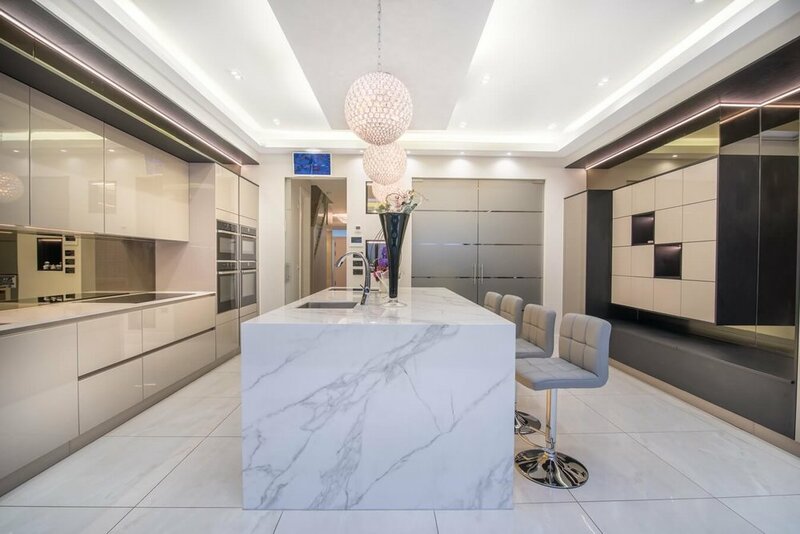 Kosher kitchens have some very specific requirements that, over the years, we have have learned how to integrate into our designs enabling us to create a wonderfully functional modern kosher kitchen. 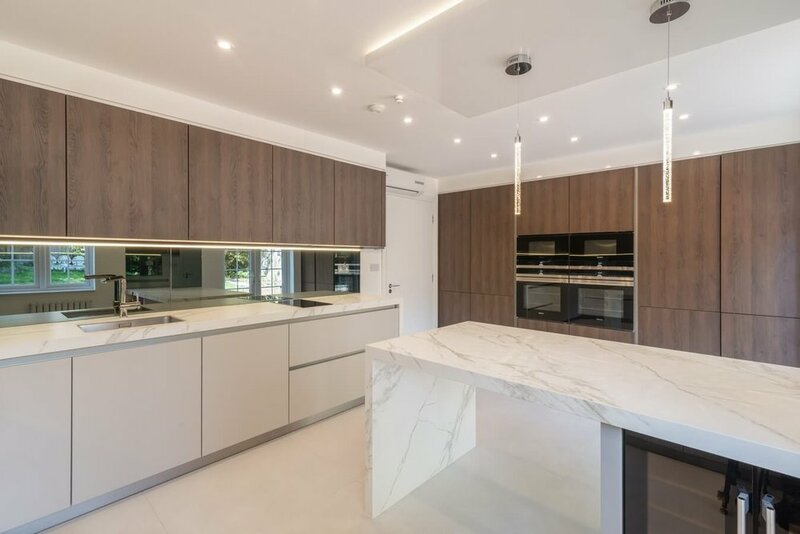 A kosher kitchen needs to have the facilities to enable the preparation and storage of different types of foods (total separation of dairy and meat), sometimes may require a hidden/separate kitchen for use during Passover and in some cases we have even put in pulley operated opening roofs under the dining area for use during the Harvest Festival (Sukkot). 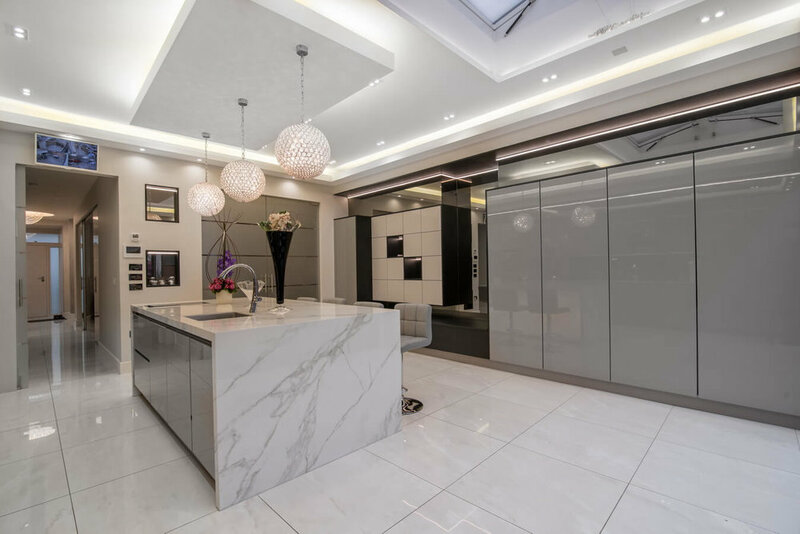 For this kosher kitchen (near our Temple Fortune showroom) we designed the layout using Schuller kitchen units, Siemens hobs and ovens and Liebherr larder fridges and freezers. 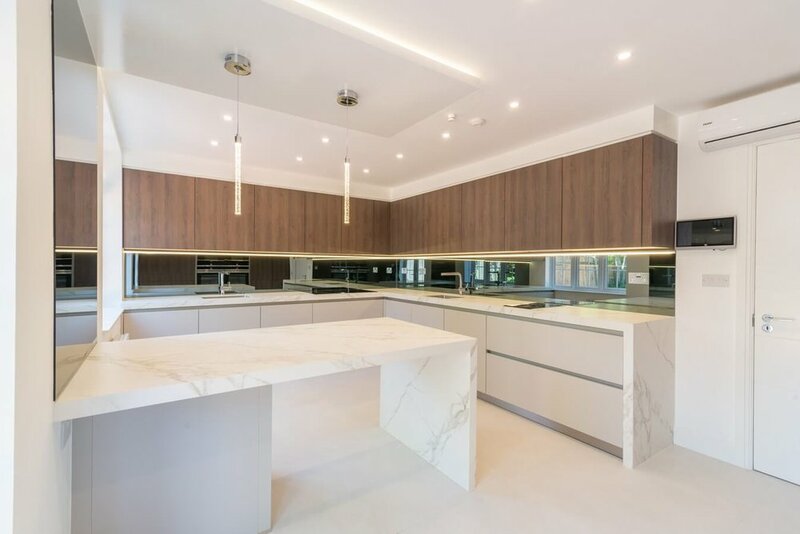 The brown oak grain wall units are in a Cremona Moor Oak finish, cabinets are a pale sand grey laminate and the stand out feature is the 50mm Neolith Calacatta worktop with its stunning marble effect and extra thick profile wrapping right around the kitchen. 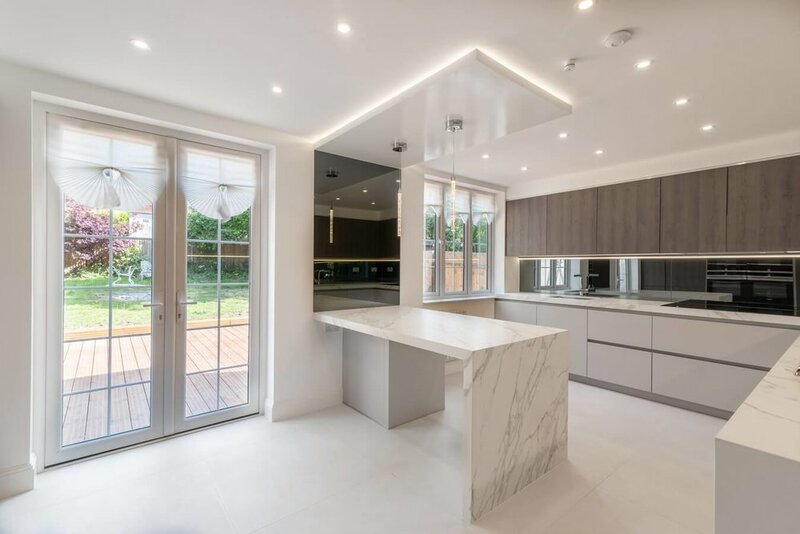 Being a kitchen for preparing kosher food, there are of course two separate cooking and food preparation areas including separate sinks and hobs laid out to the customers requirements. 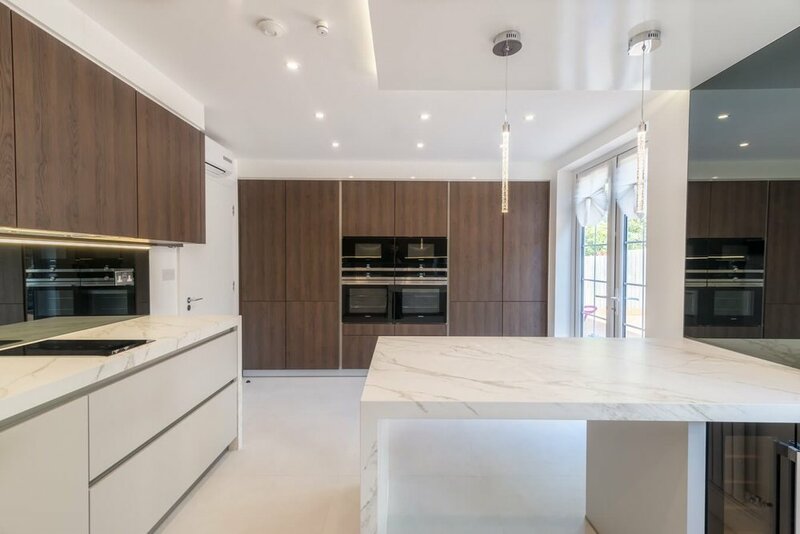 This Nobilia kitchen was our third project in North London's Stamford Hill area and the client was looking for a modern kitchen but with all the required facilities that are needed to keep a fully kosher kitchen. 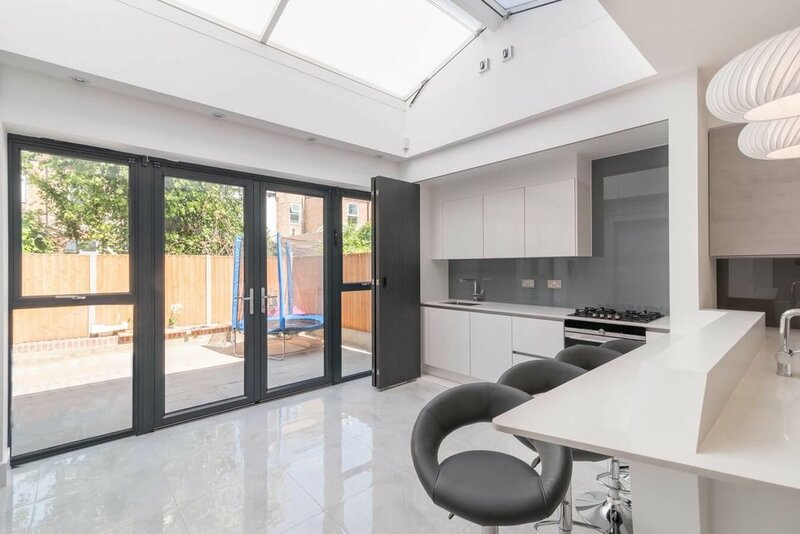 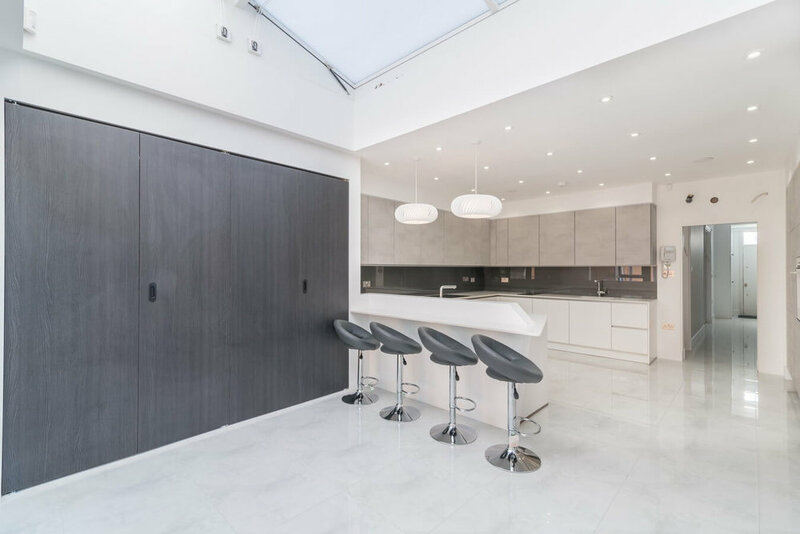 The kitchen mixes three different finishes including the latest in German kitchen cool, concrete effect wall units mixed with satin finish white lacquer floor units and a wood grain grey on the large bi-fold doors that are hiding a fully equipped Passover kitchen. 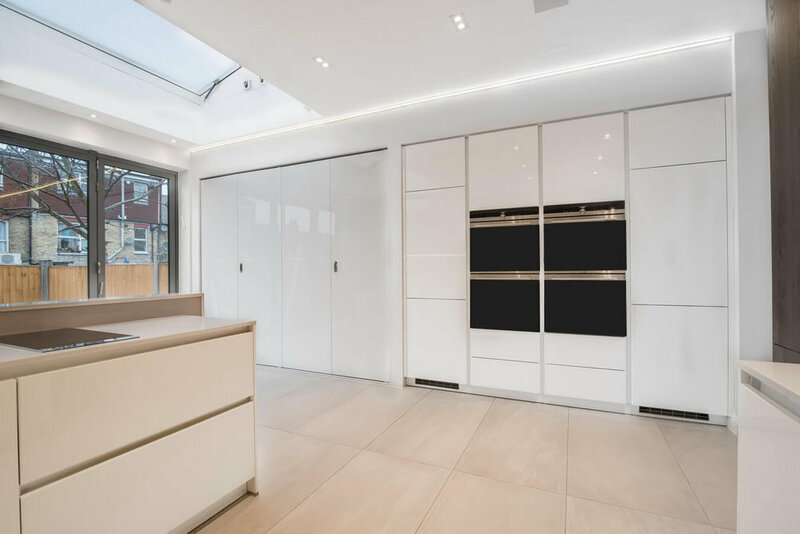 To keep things looking tidy we also installed matching lift-up lidded toy/storage boxes. 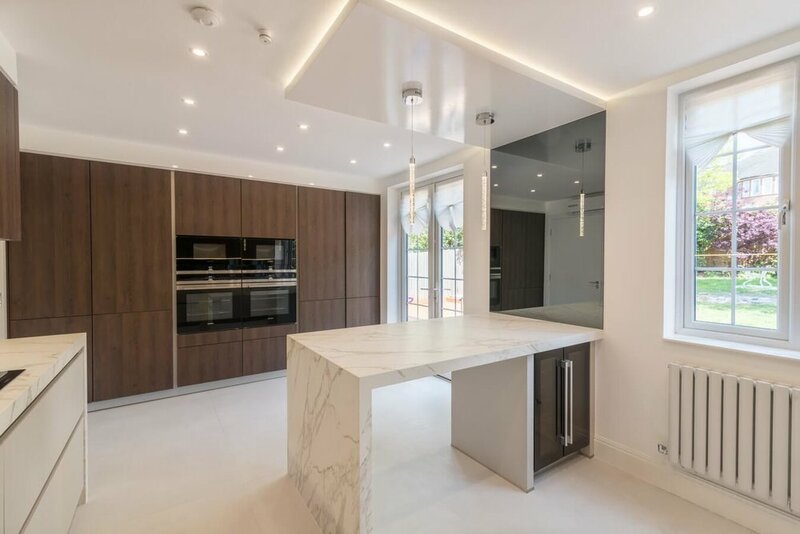 Worktops are Misty Carrera Caesarstone and there is a dark grey mirror splashback. 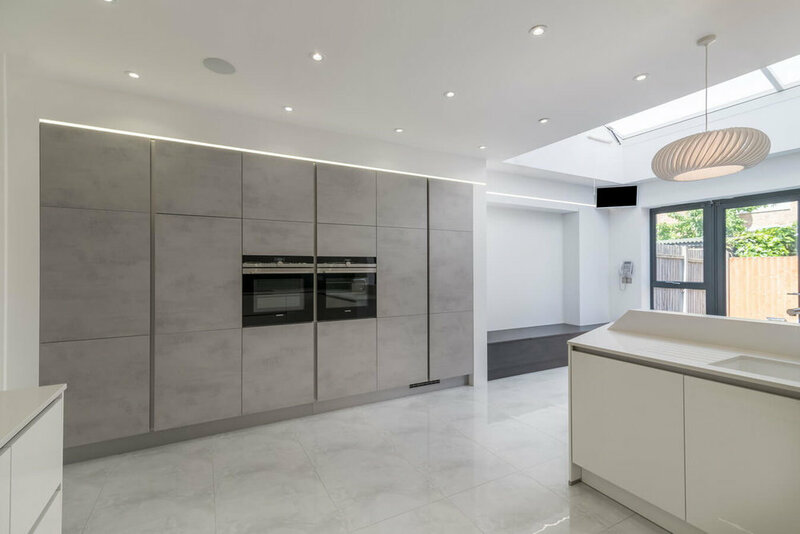 Appliances are from Siemens and Liebherr branded larder fridge and freezers. 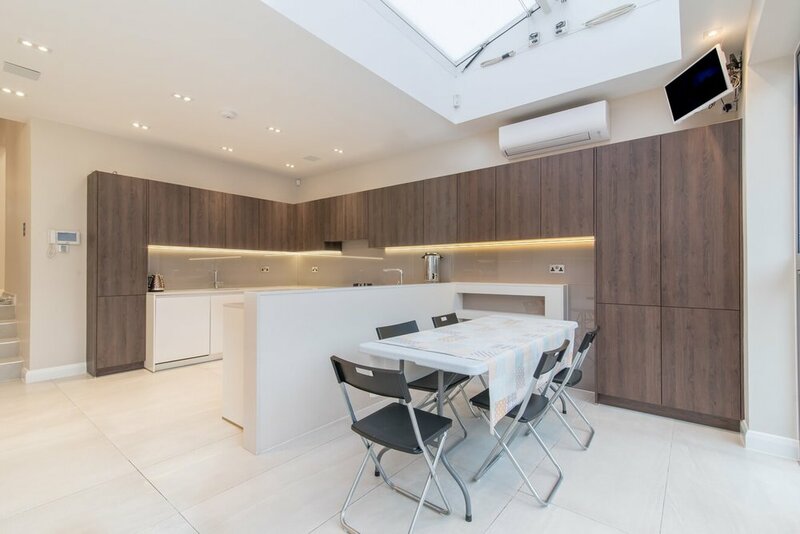 This is a great family kitchen with all the benefits of a modern kosher kitchen that not only includes multiple sinks and food preparation/storage areas but, behind a set of sliding cupboard doors is a fully equipped kitchen for use during Passover. 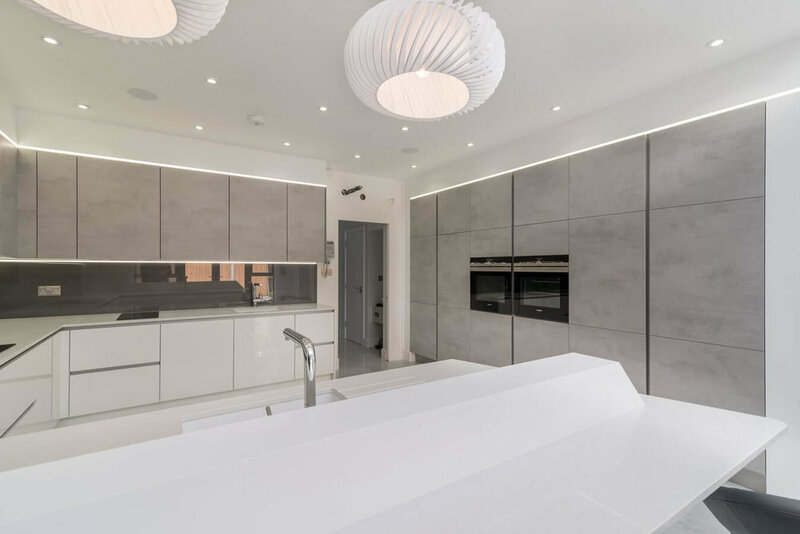 The kitchen mixes satin white lacquer units with a graphite knotty oak veneer adding a real definition to the individual parts of the kitchen. 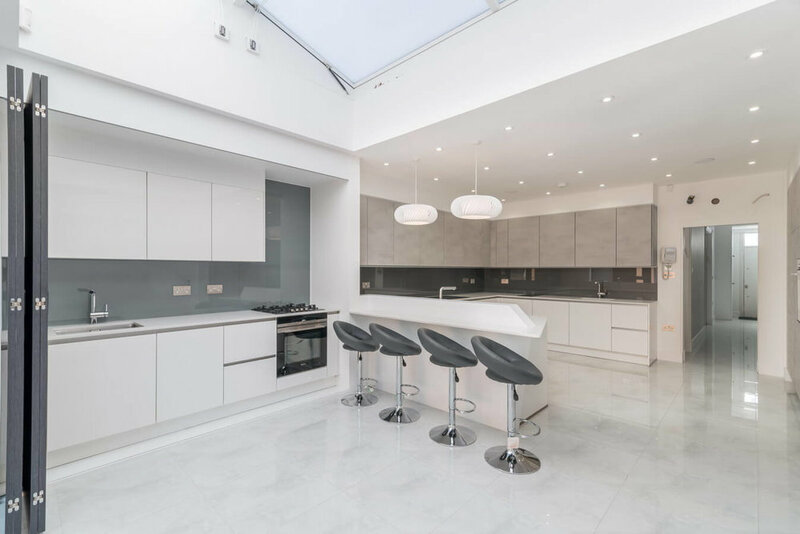 There are also two separate kitchen islands each with food preparation and cooking areas included in them. 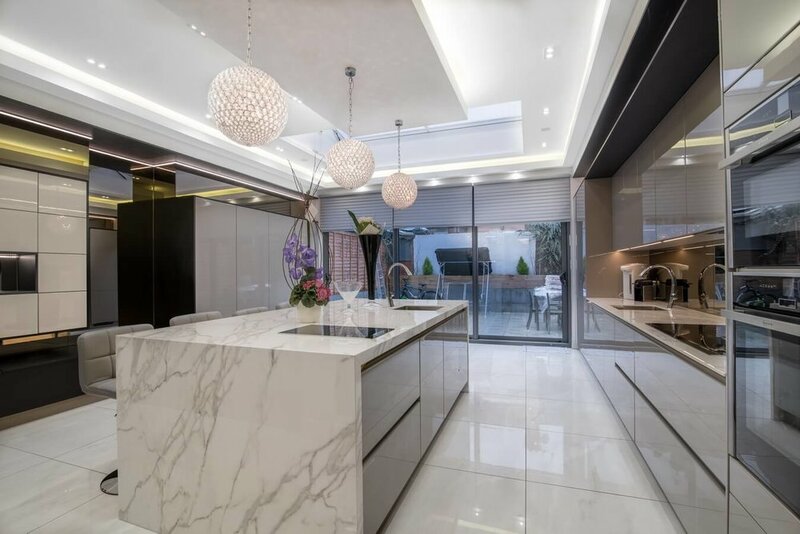 An amazing area for entertaining and creating a focal space for a large family. 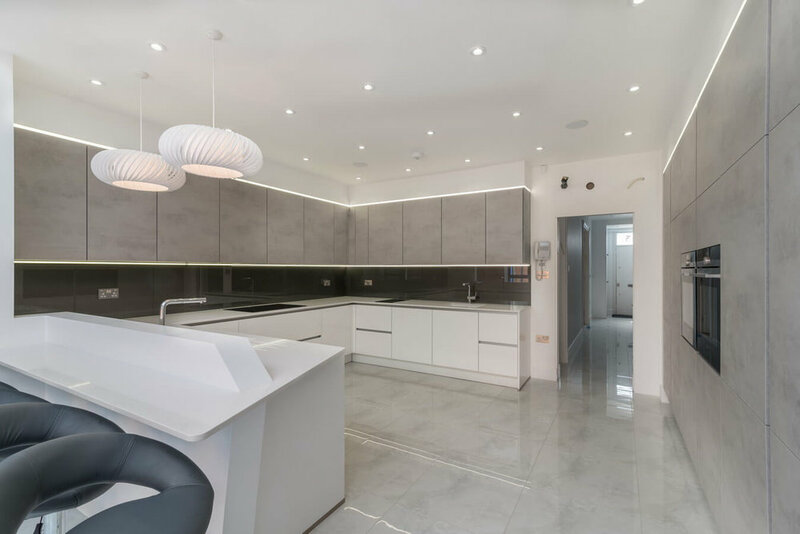 We were asked to design a kosher kitchen which, in this case is three kitchens in one, to allow compliance to Jewish religious food preparation laws. 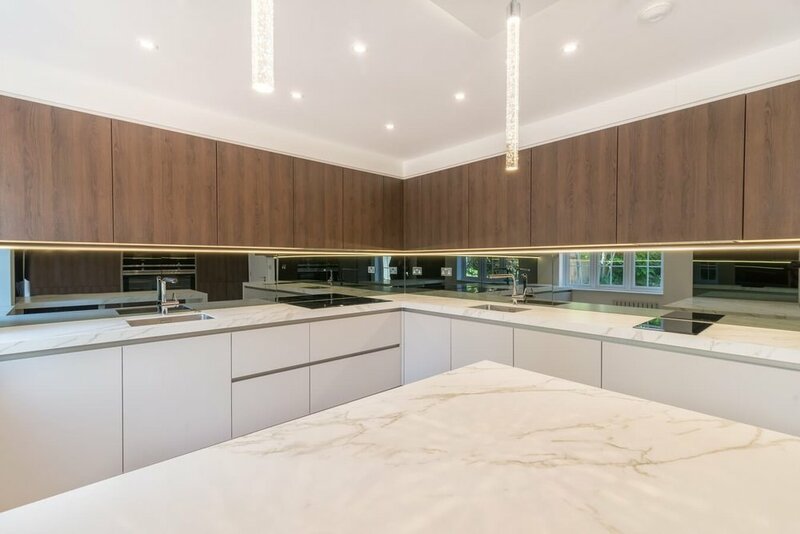 There are areas for preparing foods containing milk separate from meat based foods, and also a hidden "Pesach Kitchen" behind sliding doors which can be opened and used during the Passover festival. 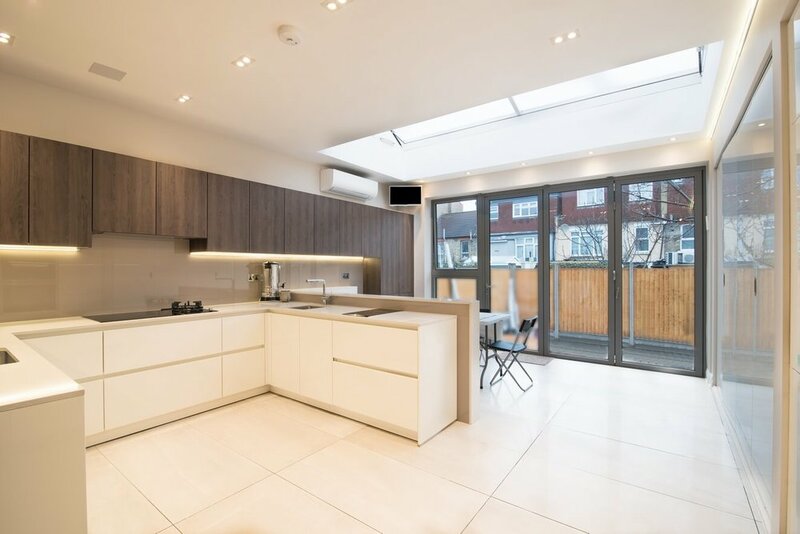 Finally, there is also a specially opening pulley operated glass skylight above the main eating area which allows the kitchen to be used during the Harvest Festival of Sukkot. 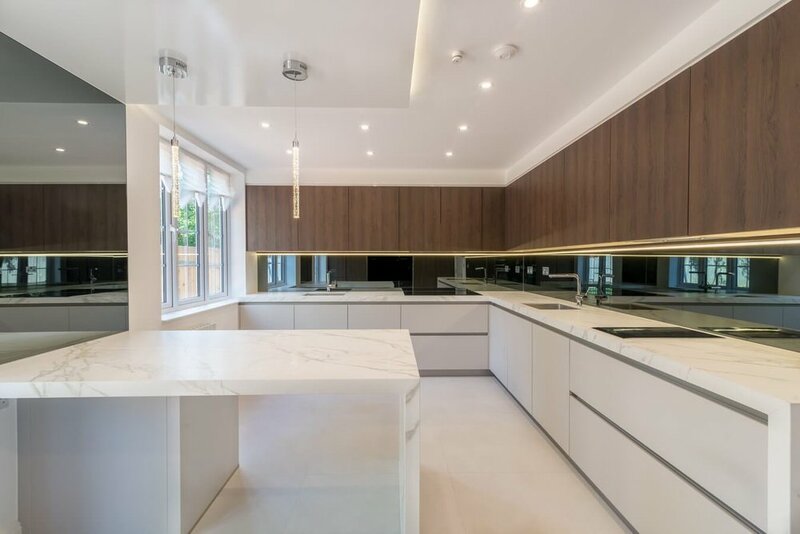 All the units came from German kitchen supplier, Schuller, finishes are Cremona Moor Oak and white high gloss with a Quartzform worktop and Siemens appliances.